The RSD range of Stripper Headers is suitable for harvesting Rice, Grass Seed and other small grains. Harvesting rice presents a unique set of challenges, high moisture, high yields and tough separation conditions. The RSD Rice Special stripper header's unique design helps rice producers gain better returns by improving harvesting performance. The RSD's 8 rows of stainless steel fingers simply strip the grain from the head, eliminating the need for the combine to separate grain from tough green rice straw. The amount of straw entering the combine is significantly reduced decreasing wear and tear to the combine in addition to decreasing fuel usage per acre. The RSD is fitted with a fixed speed belt drive system wheras the RVS is fitted with a variable speed belt drive system. Spring stainless steel flange tipped fingers give increased wear resistance as well as providing a more selective stripping action by stripping more rice and less flag leaf at a lower rotor speed. 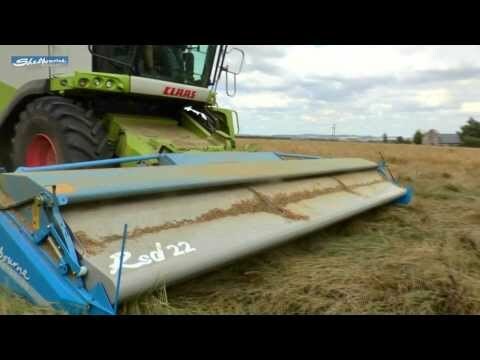 The benefits of using a stripper header in rice are pure capacity. It is quite normal to increase a combines capacity by 50 to 100%. This is achieved by decreasing straw intake into the combine and generally making the combines job easier. Productivity increases of over 100% can be achieved when harvesting in adverse conditions such as down rice. Better milling grades are very common due to less aggressive settings on the combines threshing systems because the header is doing the bulk of the threshing. Fuel consumption per acre usually falls by 25%. The net result is that you put more of a better quality rice into the bin in less time putting fewer hours on the combine. Grass seed growers from all over the world have embraced the Shelbourne header as far and away the most efficient way of harvesting almost every variety of grass and flower. Because all of the stem and trash is left in the field the combine no longer has to contend with trying firstly to thresh the seed and then separate it, with a stripper header all the combine does is put the seed into the grain tank. This all means higher yields, cleaner seed and more than 100% faster harvesting rates.